Precision machining tolerances of metal and nonmetal parts are substantially impaired by uncertainty in part temperature, due to the dimensional changes which occur with temperature. For example, most metals have thermal expansion coefficients of approximately 10 ppm per °F (approximately 20 ppm per °C). If a 10 inch (25 cm) part undergoing machining increases in temperature by only 10 °F (5 °C) from the set-up, the part will have increased in size by .001 inch (.025 mm). Accordingly, the best that the machine can do, regardless of the machine’s quality, is + 0.0005” (+ 0.012 mm). If the temperature uncertainty is higher, the tolerance increases in direct proportion. This effect is especially important as the tool wears, and significantly more frictional energy is imparted to the part. 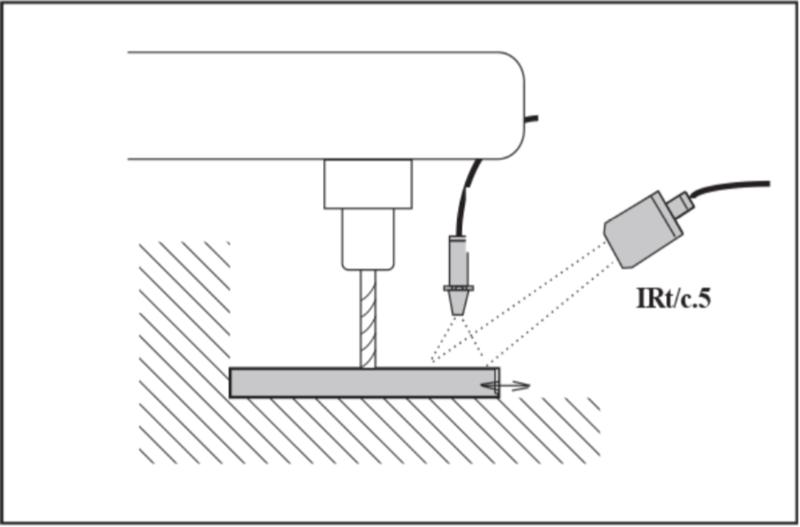 The IRt/c solves the problem by monitoring the part temperature continuously, and reporting the temperature to the computer, which in turn adjusts the position of the cutting tool accordingly. An additional benefit is detection of worn tools, due to the higher than anticipated part temperatures, or rate of change of temperature. Any of the IRt/c models can be used, although the IRt/c.3x and .5 are preferred for their narrower fields of view and built-in air purge. Emissivity of the metal parts is normally not a problem due to the presence of cutting oils and coatings. If the parts are completely clean, then a thin coating of oil will be sufficient to increase the emissivity for accurate measurements.